As I spend my weekends working on the new design for Abduzeedo I take a lot of time browsing for references and saving designs I think might be a good source of inspiration. Behance is one of my favorites because it gives to designers more room to expose their work. 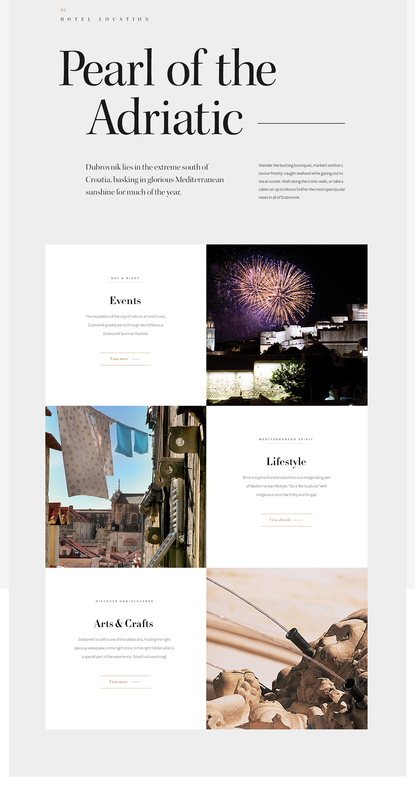 One project that I quite liked is the Adriatic Luxury Hotels Website shared by Degordian, Marko Cvijetić and Hrvoje Grubisic. The bold typography and the contrast of the layout are definitely are some of the things I like about their design. Adriatic Luxury Hotels is the collection of finest independent luxury hotels in Dubrovnik, Croatia. We created a visually attractive and responsive website to provide a user friendly experience for visitors from all devices.